Avoiding fattening foods helps you avoid weight gain and may make it easier to lose weight. Kidney beans are low in fat and high in protein and fiber, but eating too many calories of any sort can cause you to gain weight. The kidney bean belongs to the Phaseolus vulgaris L. species of plant, which also includes the pinto, black and navy bean, according to Robert Myers, writing for the Jefferson Institute at Purdue University. Any food can be fattening if eaten in excess. High-calorie treats, chips and fried foods contain high amounts of both fat and calories, making it likely that you gain weight if you consume a steady diet of those types of foods. Because fat has 9 calories per gram, foods with a lot of fat grams naturally contain more calories. You are less likely to gain weight from eating vegetables or fruits. You may be less likely to consume large quantities of kidney beans because of the beans fill you up quickly. 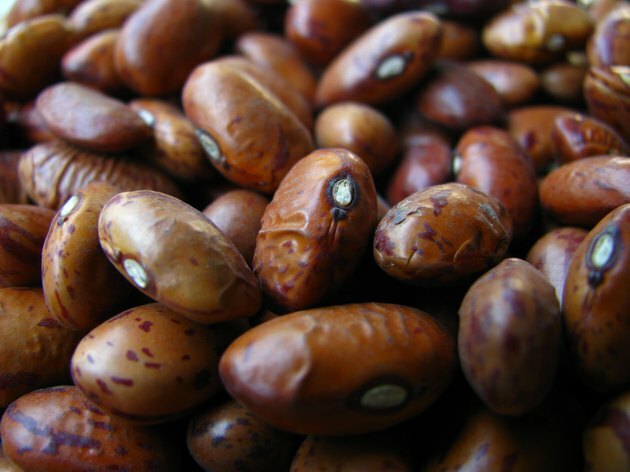 The nutrient-rich kidney bean has 310 calories per 1/2 cup of dried beans and 112 calories in 1/2 cup of cooked beans. A 1/2 c serving of cooked kidney beans without represents only 5.6 percent of a 2,000-calorie daily diet. This serving of kidney beans has less than a gram of fat and 7.7 g of protein, 5.7 g of fiber and almost 2 g of iron. The kidney beans have 115 mcg of folate, which aids in preventing spinal defects during fetal development. The kidney beans are low in fat, high in fiber and a rich source of protein. This combination can help you manage your weight. Protein and fiber both help you feel full longer, while consuming less fat in your diet may help you either lose or maintain your weight. A study published in the October 2005 issue of "Obesity Research" found that participants who consumed more fiber over a longer period of time felt more satisfied and had a lower body mass index than did those participants who consumed less fiber. Kidney beans contain a generous amount of carbohydrates, with 1/2 cup of cooked beans providing you with 20.2 g of carbohydrates. If you follow the 2010 Dietary Guidelines, a 2,000-calorie daily diet allows you between 225 and 325 g of carbohydrates a day. However, a study presented at the 2011 meeting of the Endocrine Society found that slightly reducing your carbohydrate intake can help you reduce the amount of fat in your body, according to an article on the Science Daily website. Participants in the study who ate only 43 percent of their calories from carbohydrates lost 11 percent more abdominal fat than the participants who consumed 55 percent of their calories from carbohydrates.